This sweet card features our Veranda Creative Basics Collection (12 sheets of patterned paper - 6 each of 2 styles with 4 yards of Creme Brulee ribbon not shown). The front uses one of our awesome base and shade stamps. What is a base and shade stamp? The flower portion is stamped on a piece of paper (all the Juniper blue stamping) and then another stamp has JUST the pink flowers - you line up the flower heads where they go and stamp in the color. It is so fast, easy and impressive but you HAVE to be able to see through the stamps (gotta love our acrylix) in order to be able to do it! I've used our new Togetherness stamp set to stamp Garden Green stitching around the image (just love that I don't have to actually sew on paper if I don't want to!) and then colored in the leaves with an Olive green watercolor pencil. 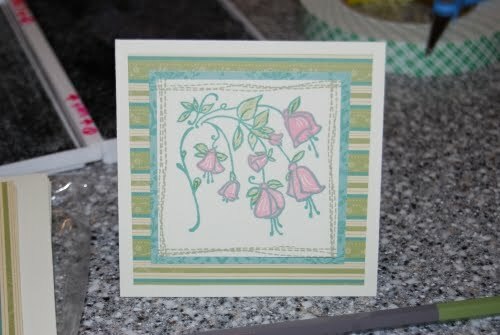 The inside of the card has the nicest of friendship sentiments "We are never alone when friends fill our lives." from the So Sweet stamp set. so sweet. Can't wait to get that stamp.